Anyone ever put in a patio (pavers)? I definitely bit off more than I could chew last fall when I took on a retaining wall (16' x 32' x 16' and mostly 8' high) project and now I need to do the pavers. I managed to do a good job with the road base and compacting it last fall and I'm more or less at about grade level but now I need to do my final grading and then run a compactor over it. So how do I go about getting the area level enough prior to running the compactor so after I compact it the area will be ready for me to throw down 1" of stone dust prior to putting the pavers down? Any tips/tricks for working with an area this large to get it just right? My driveway runs along one side so I'm using this as the level I want the patio to be and the other 3 sides will have the retaining wall running along it if that helps. Re: Anyone ever put in a patio (pavers)? Rent a transit or a laser and get a helper. Shoot the driveway top in 3 or 4 spots (no way it will be level). Take an average of this number and subtract off the paver thickness, plus the thickness of the stone dust you will be setting. This figure now becomes your rough grade number. Shoot random spots in your field of work to determine where you are high and where you are low. Keep in mind that you will want to back to be about 1/4" higher than the front (driveway side) in order to pitch and shed water. Note: If you do this over multiple days, you will need to re-shoot your driveway top each time to re-establish a base number. Grade from the high areas to the low areas checking with the laser or transit to ensure you are at rough grade and have the proper pitch. Get some one inch steel pipes and lay them on your rough grade, perpendicular to the driveway. When laying the pipe, where it meets the drive way, the top of the pipe should be flush with the asphalt, and the other end should be 1/4" higher (if not you made a mistake in rough grading) Since you are working in 16 foot lengths, either connect two or work in sections. Fill in with stone dust and screed to the top of the pipes. The top of the pipes represent your finished grade level and give you something to rest the screed on. Screed in stone dust, remove pipes (in fill gaps from pipe), and now you are ready to lay the pavers. I hope this helps, and let me know if you have any questions as I typed this in somewhat of a hurry. Oh, and one edit - it would have been easier to lay the patio first and then the walls. We had a guy on a bobcat do the rough grading with a transit. We got down to hard dirt (NC red mud) and then went back with about 4" of pea gravel for drainage and about 14" of sand. I realized later we probably should have used rock dust. I can't add anything to what RI said but while we were laying the bricks (we used full bricks and not pavers) we used a 3' level to fine tune what the guy on the bobcat had done. We used the compactor before we put down the bricks and then again on top of the bricks. Used a rubber mallet to pound the bricks level with each other. I finished it by sweeping play sand mixed with chocolate mortar into the cracks. Had to do this several times over the next year or so. However, about 8 years later it's holding up find. Not bad for our first time. I used 4x6 treated lumber for the border and know we'll have to replace them some day. I am hoping they will come straigt up and we can go back with re-bar and concrete in the holes. For a patio in the north (frost) I prefer a better base and used 4" - 6" Lin-pac (crusher run) covered with about 1 - 2" of stone dust for leveling. Pack it, wet it, pack it and pack it again and it's like rock and will not move or absorb water and frost heave in the winter like sand will. 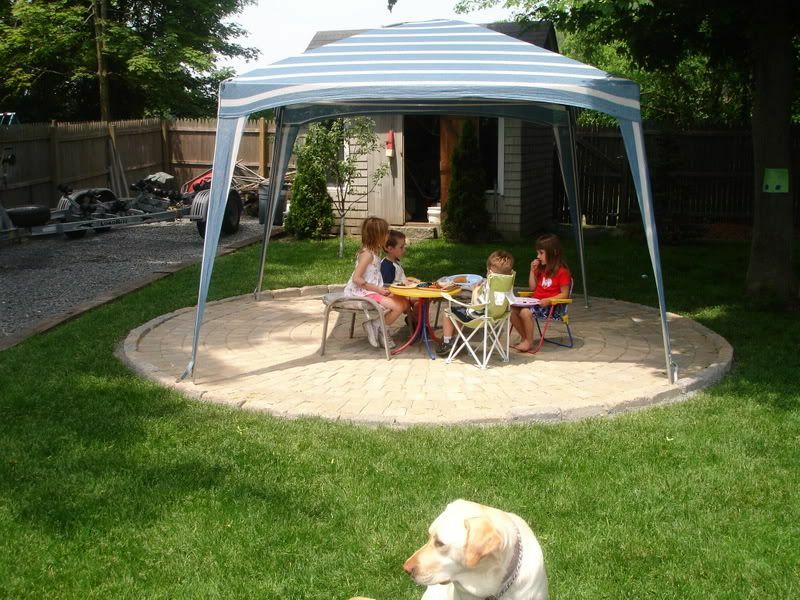 One patio is 14' X 31' done about 6 years ago, the latest was finished 2 weeks ago. I started using Poly-sand for the spaced between the bricks and it's more expensive, but "cures" and locks the bricks in from moving, will not allow ants to dig in and also nothing can grow between the bricks. It's worth the $$. Circle pack with 2 more rings to go and cobble edges. The bolded section is incorrect (it does not pay to type in a hurry). On top of the rough grade, the top of the pipe should not be flush with the drive way, the top of the pipe should be the thickness of a paver BELOW the asphalt. The other end, indeed should be 1/4" higher. Many thanks to all for offering to help! I spent some time this evening trying to grade it a bit by hand and it came out a lot better than I thought it would. It almost looks perfect but this is just eyeballing it. My next step will be take several measurements (will try to get a laser) as RI Builder suggested and factor in how I want it pitched (away from the wall and toward the driveway). After that I'll use a plate compactor on it and will then follow the steps outlined by RI Builder (identical to what Techo Bloc said to do) with the pipes and screeding the stone dust. I plan on using 1" of stone dust and figure the pavers will sink 3/8 of an inch after I run the plate compactor over them. Good call on the polymetric sand! I did my walkway 6 years ago and used stone dust. Worked well for a couple of years but that's about it. When I purchased all the materials for my recent project last fall I purchased 7 bags of Polymetric sand. I cleaned up the walkway a few weeks back and rather than use the stone dust again I used a couple of bags of the polymetric sand - that's nice stuff! I would have laid the pavers first but then I would not have been able to back fill the retaining wall properly. I'd probably tear up the pavers with a bobcat trying to dump the 35 tons of 3/4 stone I used as backfill. I'll have to snap a photo "if" I ever get this monkey off my back. DTMacket & Shag - great pictures! Thanks for sharing. Rob- I'll call you tomorrrow! I'd do it exactly like Dave said to do, but personally I'd be using more then an inch's worth of stone dust as a base for your pavers. IMO using a inch worth of stone dust forces your hand of having your grade perfect, I feel it is easier to level out your dust with the pipe method then it is to grade out your base perfectly, one inch isn't much fudge room over such a large area. Oh and make sure after you pack your stone dust base, wet it down and pack it again. Never heard of Polymetric sand. We used play sand and chocolate mortar at about a 50/50 mix to sweep into the cracks and it set up pretty good. Do you use the Polymetric as a base or to sweep in the cracks? Shag - the polymetric sand is used to fill in the cracks and is more like a sand/mortar mix. You sweep it in and mist it, let dry for 10 minutes, mist again and repeat one more time. Thanks. Sounds kinda like what we did. Since we had already used chocolate mortar in the steps, we mixed the same mortar (dry) with sand and used that to sweep into the cracks. We lightly wet it but I think the moisture from the ground helped too. I did this probably 6 times during the first year and it set up fine. Now I haven't done much of it that's for sure, so take what I say with a grain of salt, I know I know less then the good folks above this thread. I use the stone dust yes as a bedding material but I also use it as a medium which represents my finished project, less the pavers. IMO by packing my stone dust then give it a light sprinkling of water and repacking it I get a more solid base. Then when it comes to laying down my pavers all I am doing is laying them down as quickly as I can move along, there is no rubber hammer action going on per paver! I'll be working off of a few pieces of plywood to kneel on and when I'm done I'll run the compactor over the pavers to set them. Tip: drill two holes in your plywood large enough to fit your fingers, sort of like one at both ends, that way you don't have to dig your fingers into the stone dust to lift your plywood. 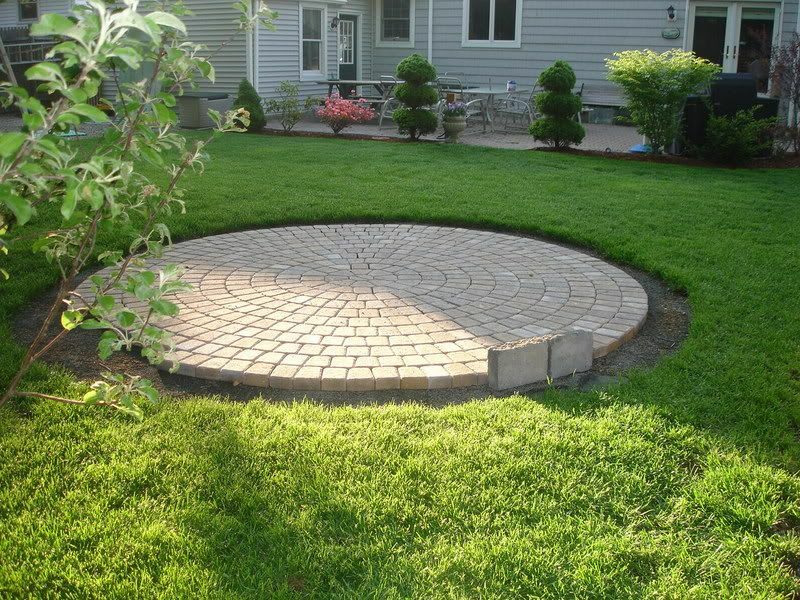 I wish to use concrete pavers to make a small solar showering area at my back door. No frost concerns, but there is fire-ant infestation in the area. Someone please tell me how to do it? Thanks very much. IMO SG you should lay your pavers in a fresh pour of concrete....the end results will be the pavers become part of the concrete pad. That way the ants have no way to take up residence under your pavers. edit: second thought: have you considered just pouring a concrete slab and having it dyed and stamped? They do some pretty nice work these days with stamping and dying of concrete! My first exposure to those little buggers I took several hundred bits on both feet and ankles, how was I to know I was standing on a mound in the grass.......man they hurt to what I recall! Thank you, Garett. Poured concrete would be OK with me if that is what it takes to keep the fire-ants out. The reason I wanted to use paving-blocks is that I already have some of those. How is it going about the houses? It's going good now that the BS is out of the way........thanks for asking SG. I would say the packing is about half done as of now......the Misses is a great gal! On the 15th we get to do a pre move in inspection........that's where we get to figure out where everything is going to go. Only twelve more days to wait, then it will be moving day...........we can't wait!